It’s a rare bird who wouldn’t like to leave a party with a treat, and that includes your auction guests. But gifts don’t have to take the form of a traditional gift bags filled with your nonprofit literature, either. In this video, I share several benefit auction gift ideas I’ve seen at events, starting with the more traditional and mundane (think edible goodies) to the more exquisite and rare. Gifts are best when they support your mission, a sponsor’s business, or both. 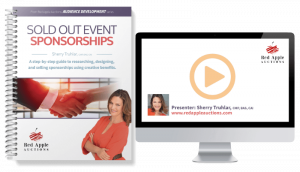 I highlight one of these in the video, but you can learn more about how to secure sponsorships for your auction with Sold Out Event Sponsorships.